Ahe sugar sector in India is facing a problem of plenty. From a seven-year-low production of 20.26 million tonnes (MT) in sugar season (SS) 2017, the current season is likely to witness a bumper production of 32 MT. A similar level is expected in SS 2019. The sugar season runs from October to September. The glut has caused prices to tumble from `37 per kg in SS 2017 to `26 per kg in May. Even fortunes of sugar companies have taken a beating. With production cost as high as `34 per kg, millers are facing losses, leading to cane dues to farmers reaching an alarming level of `22,000 crore. To help the mills clear farmers' dues, the government has announced a number of initiatives in the past couple of months. While a few had a fleeting impact on sugar prices, the impact of some will be felt in the long term. Most recently, the government announced a `7,000 crore package for the sector to enhance ethanol production, fixed minimum selling price at `29 per kg for sugar at factory gate and announced creation of a 3 MT buffer stock to absorb surplus. Will these measures help this cyclical sector? The sector is neither new to slump in sugar prices nor pile-up of cane arrear. For instance, in April 2015, cane arrears had reached an alarming level of about `22,000 crore. "India's sugar sector follows a cycle. There again has to be a demand-supply mismatch and sugar prices will have to go up," says Sageraj Bariya, Vice President - Institutional Sales, East India Securities, who has been tracking the sector for over a decade. "We are already into a downward cycle." The downward cycle will stay for a couple of years. But, this time, the sugar surplus is too huge to ignore. Analysts believe sugar prices can recover only if mills export more and shift some cane for ethanol production. But exporting sugar is easier said than done. The global market is in peril. The International Sugar Organization, an inter-governmental organisation, has estimated a sugar surplus of over 10MT in 2018 on the back of bumper production in India, Thailand and production ramp-up in Europe. In rupee terms, international sugar prices are lower by at least `8 per quintal. Mills will need some subsidy, analysts feel. To increase domestic prices, India needs to ensure that around 6MT sugar is sold through exports. This is after considering demand for 25 MT, an opening stock of 4 MT and 3 MT buffer (two months). For the current season, the government has already announced a 2 MT export target, which the mills are finding it difficult to meet. But companies are hopeful that prices will recover as exports pick up. "When the international price also starts going up based on international market conditions, exports will become more profitable," S. Suresh, Managing Director, E.I.D. Parry, a south India-based sugar firm told analysts in a conference call on May 10. The industry has been demanding higher quota for exports for the next season. "I think the industry is also pushing for another tranche of exports for the next sugar season. It should be somewhere in the range of 5 MT to 7 MT. That is what is going to bail out the industry," said Suresh. Foreign brokerage Morgan Stanley, in a note dated May 29, said it believes that global sugar prices could decline further before improving only in 2020. Another trigger for the rise in global sugar prices is the shift in cane usage for producing ethanol. With crude prices rising above $75/barrel, Brazil, the world's largest sugar producer, has already started a shift towards blending petrol with ethanol. The gap will be filled by Indian exports. Ratings agency India Ratings & Research, a local arm of the Fitch group, believes that rupee depreciation has increased the viability of India's sugar exports. Like Brazil, even India is pushing hard for blending ethanol with petrol. Ethanol is produced from molasses, a by-product of the sugar making process. The government has already created an assured market for ethanol by allowing blending of up to 10 per cent of ethanol in petrol at a price of `40.85 per litre. More diversion of sugarcane towards ethanol production will augur well for the industry, especially during times of high production. So far, only around 4.3 per cent blending has been achieved, due to shortage of ethanol. "Ethanol generates higher margins than sugar for integrated sugar mills and is also less cyclical. Besides, government subsidy is expected to increase the viability of this investment," ratings agency Crisil said in a recent report on the sector. On June 6, the government announced soft loans to the tune of Rs4,400 crore and interest subvention for augmenting ethanol capacity in India. Around 80 per cent a mill's expense is towards cane. "For millers, the raw material is decided by the government, while the selling price is decided by the market. The ideal solution is linking cane price to sugar price," says a research analyst with a Mumbai-based broking firm. Assured returns in the form of the Centre's fair and remunerative price (FRP) and states state advised price (SAP) for cane have prompted farmers to grow more cane over the years. For instance, the Centre's FRP jumped from Rs145 per quintal in SS2012 to Rs255 per quintal for SS17/18. SAP in UP has moved from Rs280 per quintal in SS 15/16 and Rs305 per quintal in SS 16/17 to Rs315 per quintal in the current season. The C. Rangrajan committee had suggested a revenue-sharing formula in 2012. "Adoption of a revenue-share formula where farmers and mills share the revenue in the ratio of 70:30 will be structurally positive for the sector and the sector will rerate itself. But, it's a politically sensitive matter," says Sageraj of East India Securities. Only a few states have accepted the recommendations. Sugar stocks have been battered on concerns of a supply glut since December last year. Government measures have offered some relief but a full-fledged recovery is elusive and subject to improvement in the domestic demand-supply situation. But with the government actively toiling to rescue the sector, coupled with hope that international prices will firm up, investors with a medium to long term vision can keep an eye on any meaningful progress on sugar exports and ethanol production. "Numbers would worsen from here. Stocks would negatively react. (But) the government has been pushing big time. If there is any further correction from here, one should buy for a three-four year horizon," says Sageraj of East India Securities. Analysts recommend integrated sugar companies like Balrampur Chini Mills, Dwarikesh Sugar Industries and EID Parry for the medium to long term. These will be among the first few to benefit when the sugar cycle turns. 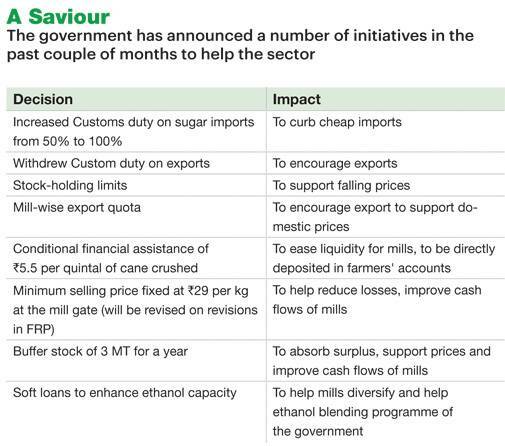 But the real game changer for the sector would be linking of cane prices to market prices of sugar.